The exhibition featuers some 30 works from The Met collection. Inscriptions and images on Islamic arms and armor were believed to provide their wearers with safety and success in combat. The exhibition Power and Piety: Islamic Talismans on the Battlefield, opening August 29 at The Metropolitan Museum of Art, will examine the role of text and image in the construction and function of arms and armor in the Islamic world. Qur’anic verses; prayers that invoke Allah, the Asma al-Husna (99 Beautiful names of Allah), as well as the Prophet Muhammad, his family, and companions; and mystical symbols were all used to imbue military apparel, weapons, and paraphernalia with protective powers. The exhibition will feature some 30 works from The Met collection. The exhibition will be organized into five thematic sections. The first will establish the context for understanding the empowering inscriptions and symbols that can be found on Islamic arms and armor. It will examine a variety of textual and iconographic sources, such as the Qur’an, prayer books, and votive tablets (Hilya). In addition, several works will reference the bifurcated, miraculous sword Dhu’l Fiqar that the Prophet gave to ‘Ali (his cousin and son-in-law) in the Battle of Uhud (625 AD). The sword became a widely recognized relic and symbol of military triumph, often associated with ‘Ali (the first Shi’ite Imam or spiritual leader after the Prophet), as evidenced by an Indian sword and Persian saber on display. The next three sections, with a geographical focus, will show objects from Iran, Turkey, India, and southeast Asia. The works will include armor (helmets, mail shirts, and cuirasses); weapons (daggers and sabers); and paraphernalia (banners and standards). The strategic placement of inscriptions and symbols—to protect a soldier’s most vulnerable and vital parts—will also be considered. 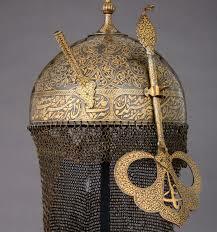 For example, the inscription of the name “‘Ali” on the nasal guard of a helmet from India was intended to bring added protection to the wearer’s face. The final section will feature objects such as personal Qur’ans and seals that may have been carried into battle for good luck. The exhibition was organized by Maryam Ekhtiar, Associate Curator, Department of Islamic Art, and Rachel Parikh, Mellon Curatorial Fellow, Department of Arts and Armor. Education programs organized to accompany the exhibition include a series of gallery talks for general audiences.